This Gojooasis tomato house is ideal for growing tomatoes in gardens or outdoor spaces with no greenhouse available. They are very easy to put up, & create a hot growing space for tomatoes, chilies & other greenhouse plants. 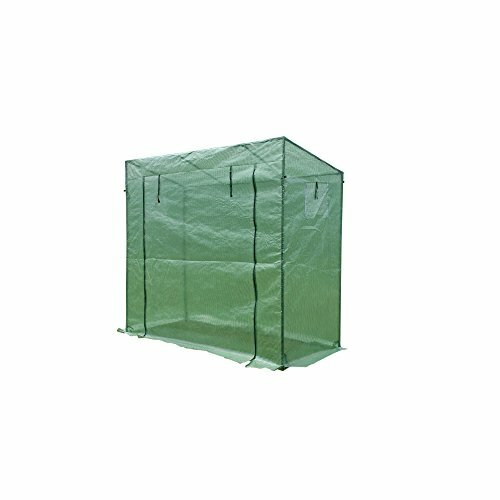 It will provide a best protection in rainy and cold days, your plants can enjoy sun bathing and grow healthier in this greenhouse. We are always try our best to provide excellent products and service,and located in America, provides extremely fast shipping. We are specialized in Home&Garden Products manufacturing, direct sale from manufacturer, lower price, higher quality and guarantee. High quality portable garden house built with heavy-duty powder coated metal frame. Double roll-up zippered front door + 2 exhaust vents for cross ventilation and venting on hot days, Easy assembly with no tools required. Heavy duty transparent reinforced 140G polyethylene Cover material for maximum solar performance, 100% UV protected & waterproof. DIMENSIONS of the Tomatoes Greenhouse shed- 77.95" Long x 29.53" Wide x 66.54/61.02" High, Overlong Cover Design makes greenhouse more airtight and secure, just bury it in the soil, easy way but useful. Green house offer beneficial living condition to various Upright plants for quick and healthy growth.Protect your plants and herbs in all weather.